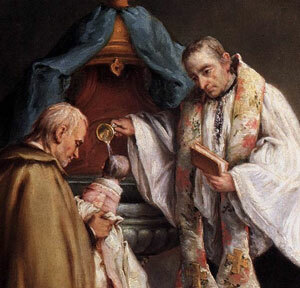 What is the Total Consecration of St. Louis de Montfort? [The Flood] prefigured baptism, which saves you now. It is not a removal of dirt from the body, but an appeal to God for a clear conscience, through the resurrection of Jesus Christ. During the season of Lent the Church militant joins with those to be baptized at the Easter Vigil in contemplating the mystery of the sacrament of baptism. Lent is a time for a renewal of our baptismal vows and a rekindling of the grace that was given us in the sacrament. Thus, we must consider what it is that happened in our own baptism. To this end, the Church gives us to read from the First Letter of St. Peter, in which the waters of baptism are compared to the waters of the flood. Further, the Vicar of Christ speaks of the bodily washing effected through water, and the spiritual washing brought about through baptism. If Christ could not sin, how was he tempted in the desert? 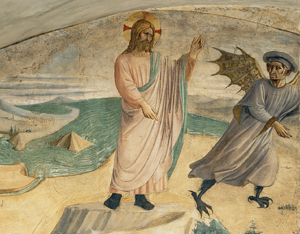 The Spirit drove Jesus out into the desert, and he remained in the desert for forty days, tempted by Satan. We know that Jesus was truly tempted in the desert, for such is the teaching of Sacred Scripture. And yet, it should be clear that Our Savior could not – he simply could not – sin. The Lord Jesus is impeccable, he cannot sin. If the Church teaches that Jesus could not possibly sin, in what sense can we affirm that he was tempted in the desert? Sometimes it seems that the media is dead set against the Church, and then you come across an article like this one [“Lent 2012 offers a rare way to honor Mary and Jesus at the same time”, here], written by L.A. Times staff writer Rene Lynch. Let us all offer a prayer of gratitude to the Good Lord for spreading this devotion. Also, say a prayer for Rene Lynch and for all who read her article, that the grace of Christ given through Mary will indeed make this their best Lent ever. Join the Total Consecration page on Facebook [here]. Also, [here] is a how-to guide for making the Total Consecration this Lent, together with prayers for the first twelve days. The Total Consecration is principally an interior devotion – it does not consist primarily in the recitation of many prayers, but in offering all that we do to Jesus through his Mother. 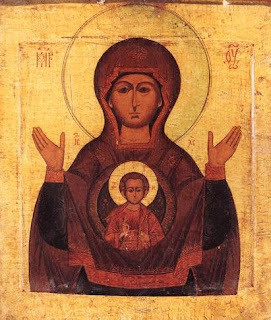 Jesus has given us all things, including himself, through Mary; let us then give to this same Jesus all things, including ourselves, through Mary! However, St. Louis-Marie de Montfort directs us to prepare for this act of Total Consecration with thirty-three days of short prayers and spiritual practices. By a unique set of circumstances, this preparation period begins this year on Ash Wednesday (February 22nd) in order to make the consecration on the Solemnity of the Annunciation (this year, March 26th) – for more about this rare parallel between the beginning of Lent and the preparation for the Total Consecration, see our earlier article [here]. In this article, we will consider what exactly we do in these preparation days. What prayers do I say each day, starting on Ash Wednesday, in order to unite this Lent with the Total Consecration? Also, consider joining with others in the Total Consecration through Facebook [here]. The season of Lent is meant to be a time of a great renewal in our baptismal vows. As the catechumens prepare to enter fully into the Church at the Easter Vigil, all of Christ’s faithful take this time as an opportunity to renew the grace of our own baptism. Happily, this is precisely the goal of St. Louis-Marie de Montfort’s “Total Consecration” to Jesus through Mary. We have a unique opportunity this year to unite our Lenten devotion with the Total Consecration, since (on account of the rarest of circumstances) the thirty-three day preparation period for the consecration begins on February 22nd, Ash Wednesday. The Total Consecration has only fit together with the beginning of Lent twelve times since de Montfort’s death, and it will not happen again until 2075. Hence, this is truly a most rare opportunity for us to consecrate this Lent to Jesus through Mary. Please spread the word through Facebook [here]! 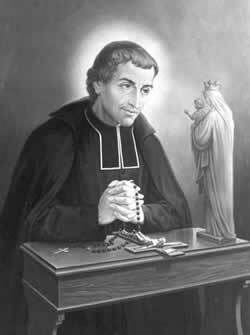 St. Louis-Marie Grignion de Montfort recommended a particular method of consecrating oneself wholly and entirely to the Most Blessed Virgin Mary and, through Mary, to Jesus our Savior. This method includes thirty-three days of preparation, followed by the act of consecration itself. St. Louis de Montfort most especially recommends that this consecration be made on the feast of the Annunciation, though other days are also acceptable. When does Anointing of the Sick cause physical healing? We have all heard that some people have been physically healed through the reception of the sacrament of Anointing of the Sick, but we wonder why this occurs only sometimes and not always. Why is it that God heals one, but allows another to die? What makes Anointing here cause physical healing, but there only spiritual healing? This Sunday’s Gospel gives us the beginning of an explanation to this complex question. Why can't deacons confer Anointing of the Sick? 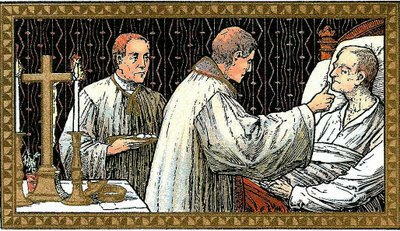 Deacons can baptize and they can witness marriages, they can even distribute communion as an ordinary minister, and yet the Church does not allow deacons (nor any who are not priests) to confer the sacrament of Anointing of the Sick. A brief consideration of this question – Why can’t a deacon confer Anointing of the Sick? – will teach us a great deal about this sacrament. Anointing of the Sick is surely the most misunderstood sacrament in today’s Church. However, I do not think it is so much that the faithful are too reserved in requesting it (as was the case in ages past), but rather it seems that the sacrament is far too often used in cases when it is not really appropriate. It is clear that the very close connection between Anointing and death has largely been lost over the past fifty years. The Ecumenical Council of Trent declared that Anointing is the “sacrament of the dying”, and even Vatican II says that Anointing can still be called “Extreme Unction” (though admitting that “Anointing of the Sick” is better). Pope Paul VI specified that the “sick” who are to be anointed are those who are seriously ill. 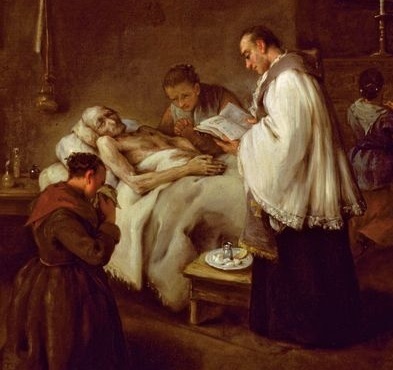 The Church’s teaching from Vatican II, to Pope Paul VI, to the Code of Canon Law specifies that Anointing of the sick is only to be given to those who have begun to be “in danger of death” whether from sickness or old age. 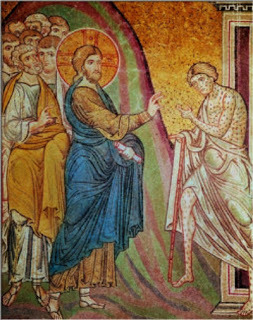 Though not the first miracle of his public ministry, Jesus’ healing of the leper is certainly the first miracle he worked after relating the Sermon on the Mount (as is clear from St. Matthew [8:1]). Thus, it is striking to note that, immediately after preaching the great sermon which collects all of his message into one, he shows us the meaning of this preaching by touching a leper with love. This act – taking pity upon, touching, and healing the leper – teaches us by example those same truths which our Savior had taught by words in the Sermon on the Mount. Thus, it will be no surprise that the conversion of St. Francis of Assisi began with a leper. Further, we do well to recall the memory of St. Damien of Molokai, who so loved lepers as to become a leper himself – much as Christ loved us and became one like us in all things but sin. 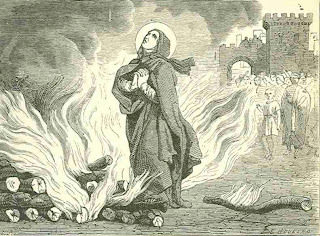 Many of the martyrs speak of their desire for death with a greater zeal than we desire life – for they would suffer untold torments in order to achieve their death, but far too often we would rather die than suffer greatly in order to live. And yet, without intending any dishonor to the martyrs, we may wonder: How is martyrdom different from suicide? Indeed, many of the ancient martyrs longed for death and even put themselves in harm’s way in order to achieve martyrdom – is this not, in some respect, similar to suicide? The case of St. Apollonia (whose memory is commemorated this day, though not in the general calendar) will give great insight into this question – she voluntarily threw herself into the fires which her persecutors had prepared for her. Can a pregnant woman be anointed on behalf of her dying unborn child? This coming Saturday, the feast of Our Lady of Lourdes, is designated as the World Day of the Sick. 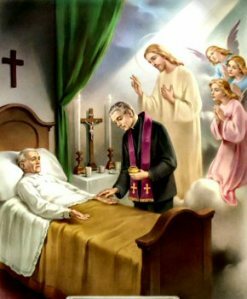 In preparation for this day, we will be considering several questions regarding the Sacrament of Anointing of the Sick, or Extreme Unction. Today, I wish to consider the particular question of anointing a pregnant woman on behalf of her unborn child who is in danger of death – there are several reasons why such an anointing would be a sacrilege and invalid, though (of course) we would not assign any fault to the woman but rather to the priest. This particular case will teach us a great deal about the sacrament. 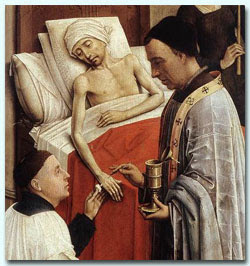 We have already considered several important aspects of this sacrament: That it can only be given to those who are in a real danger of death (“How sick is sick?” [here]), that surgery cannot ever be the reason for Anointing but can be the occasion (“Should Anointing of the Sick be given before surgery?” [here]), and that young children cannot receive this sacrament [here]. 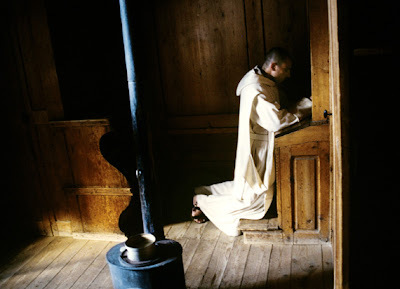 A Carthusian monk, from the film "Into Great Silence"
Rising very early before dawn, [Jesus] left and went off to a deserted place, where he prayed. After exorcising a demoniac, healing St. Peter’s mother-in-law, and curing many others, Jesus teaches us the absolute primacy of the interior life by rising early the next morning, before it was day, so as to go to a deserted place and pray. 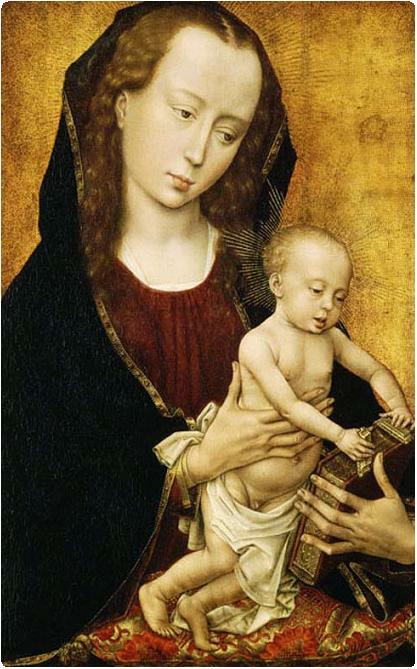 If Christ did not "open the womb" of his Mother, why was he presented in the Temple? The Church teaches, as a matter of dogma (de fide) which every Catholic must believe, that Mary was a virgin not only before birth and after birth, but also during birth. 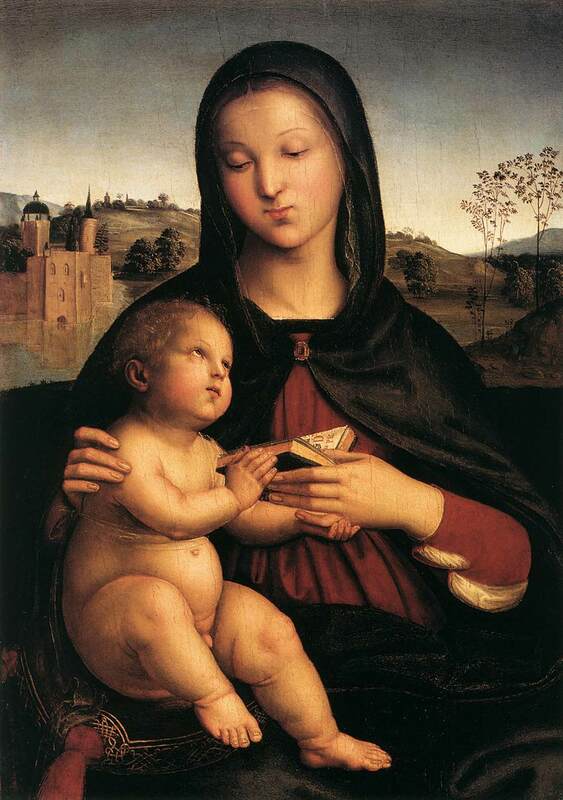 This dogma states that Mary, even during the very act of giving birth, remained a virgin – hence, the word “virgin” refers not merely to refraining from sexual pleasure, but also to physical integrity. However, the above verse from St. Luke’s Gospel seems to be against the Catholic dogma of Mary’s perpetual (physical) virginity. It seems that the Evangelist is telling us that Jesus was presented in the Temple precisely because he had opened the womb of his Mother, violating her physical integrity. How can the Catholic answer this objection?